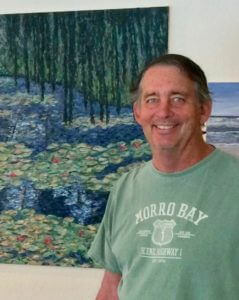 LeighPaintings.com includes images of original paintings by Leigh Cohn, Carlsbad, CA. All images are copyright protected by The Cohn Family Trust and may not be used for any commercial purposes without consent. To request the use of any images from this website, send an email via the Contact Us form. Whose names are listed in the captions of the paintings? Leigh gives his paintings away, and he lists the recipient's name and city at the time of the gift. Thus, some of the same names are repeated with different cities, if they have lived different places when the painting was given. If you own a painting, you can search for your name, which will indicate where it is shown on this website. If your name is included and you want it removed or somehow changed, please send an email via the Contact Us form. What is the size of the actual canvases? The measurements are listed in the captions in inches. How does someone request an original oil painting? When Leigh has paintings to offer, they are listed on the "Available Paintings" page, usually only for a short period of time. They are announced through the LeighPaintings blog. Sign up for the blog on the Contact Us form. • Your name, address, phone number, and email address (none of this information shall be shared). • The name of the painting(s) you are requesting. Sometimes multiple people request the same painting, so it's a good idea to list more than one option. • Any additional information about how you saw the painting, why you want it, and if you know Leigh or someone who has one of his paintings. The paintings are given away for free. However, shipping and handling rates will be required (unless the picture is picked up in person), and costs of framing will be added, if applicable. Leigh will provide the amount based on the size of the canvas, whether or not it is framed, and where it needs to be sent (from CA). If the quoted shipping costs are too high, you may decline the painting. A check made out to "Leigh Cohn" must be received before the painting is shipped. Why does Leigh give away his paintings? Read his blog article, "Why I Give My Paintings Away?" Can I resell or give away paintings I receive? Sure. Since Leigh gives away the paintings, they have no inherent value. Nonetheless, feel free to place a value on yours if you wish to sell or insure it. Can I reuse the image of my painting? Yes, but just for a picture you were given and for personal, non-commercial purposes only. As stated above, all paintings and images are protected by copyright. Can I get giclée copies, prints, or other reproductions from any paintings on the website? Yes, all of the paintings can be reproduced (except the ones donated to Balboa Park, who own those rights). Reprints can be any size or format and can be of full paintings or details, and they can be giclée (print on canvas), posters, t-shirts, coffee mugs, etc. They may only be obtained from LeighPaintings.com. Use the Contact Us form to ask about particular pictures, formats, and pricing.